Oh the holidays sure do bring a lot of travel. There is so much you need to take with you when you have a baby. 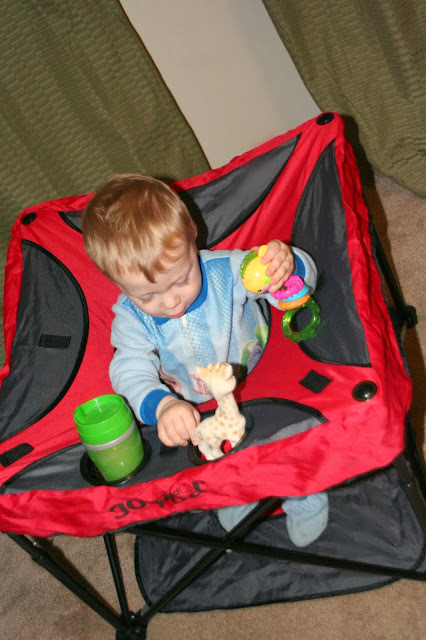 Well, Kidco just made your life so much easier with the GO-POD! 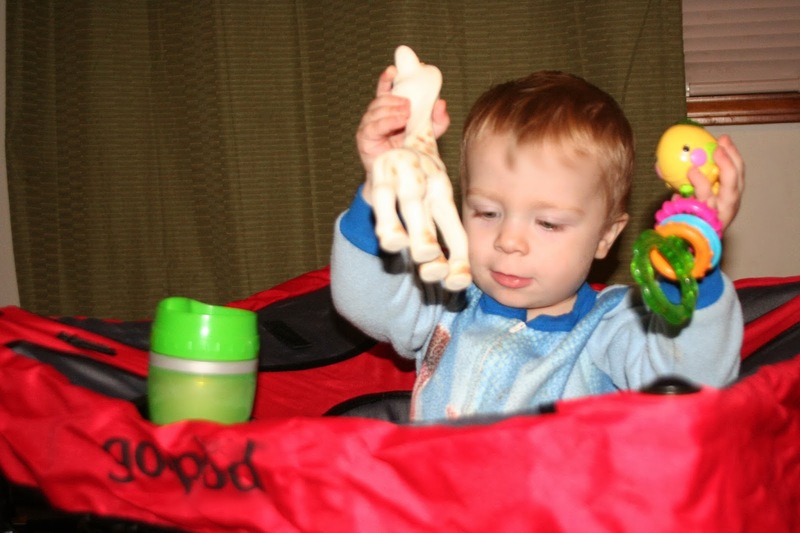 If you travel with your baby at all you are going to LOVE the GO-POD! I find having an activity seat an invaluable piece of equipment in our house. But let's be honest, it isn't the easiest thing to transport to grandma's house. 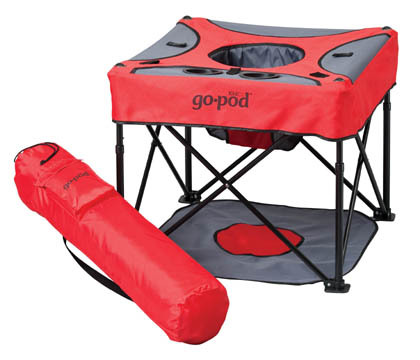 The GO-POD collapses down and fits into the carrying bag just like the popular camping chairs. The carrying strap makes it easy to transport. By the way it is very light weight yet sturdy. 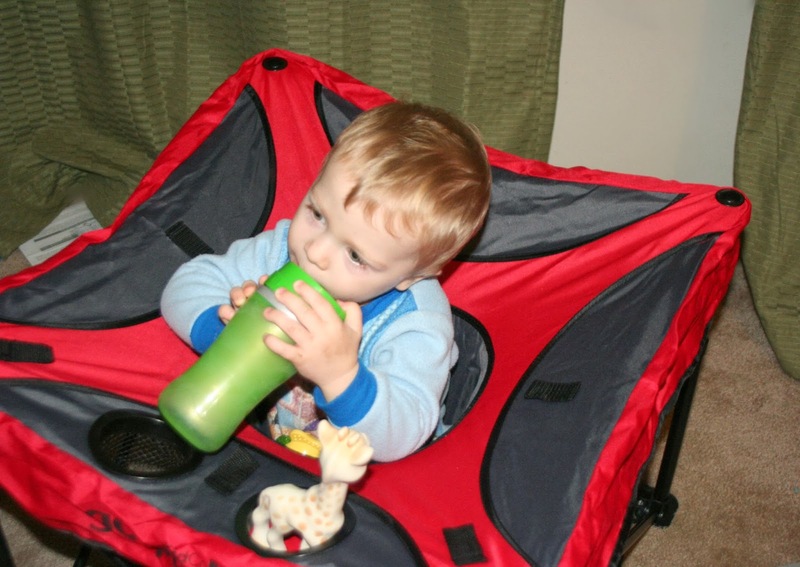 The two cup holders make a great place for a sippy cup and some snacks. The material cleans up easily with a damp sponge. The sides have nylon toy loops for attaching toys so they won't land on the floor. If your baby's knees are bent you just adjust the height and there are four different positions! It goes up high for the extra tall babies. The possibilities are absolutely endless with this product. Not only can you take it to the relatives house, but think about a hotel room or a soccer game for the older siblings. How about a picnic in the park? I'm thrilled to be able to use it for so many different events. Storage Bag – Includes pocket for wallet, keys, ipod, etc. Kidco makes some other great baby gear including baby-gates so be sure to check out their website and connect with them socially on Facebook and Twitter!